After some deliberation I decided to go with the most memorable episode rather than the ones with the most raw animation, and what left the biggest impression in 2014 was Yama no Susume S2 #13. The sheer visual variety within that (half-length) episode is amazing, there’s relatively low-key character cuts coexisting with fantastic effects, cuts with very detailed lighting effects as well as incredibly stylized, cartoon-like moments. Even the few bits that aren’t really animated are gorgeous (like Hisashi Mori’s fairy tale), and it gets extra points for featuring what was the most beautiful animated scene this year as far as I’m concerned. If you’re interested in different techniques and styles possible in 2D animation, look no further than this episode. Plenty of worthy runner-ups this year, even within this same series – Ebata’s #17 had some of the most expressive animation this year for instance. Speaking of solo KA episodes, Takashi Kojima’s Shigatsu wa Kimi no Uso #5 is a non-stop display of excellent character acting, further proving that his skill isn’t limited to action cuts. It goes without saying that plenty of Space Dandy episodes have mind-boggling animation as well, and its finale easily contains the most animation you’ll see on TV this year. BONES might not have reached the level of Star Driver #25, but it was damn close. Dandy is hands down the best animated series this year, so I will proceed not to talk about it because everyone else will and 20 essays about the same show would be a pain to read and not very educational. Putting that aside, my extended honorary mentions mostly go to Yama no Susume S2 and the still ongoing Shigatsu wa Kimi no Uso. The former’s been a showcase of individual and collective talent, it’s got many solo animation episodes that serve as perfect examples of each animator’s style. 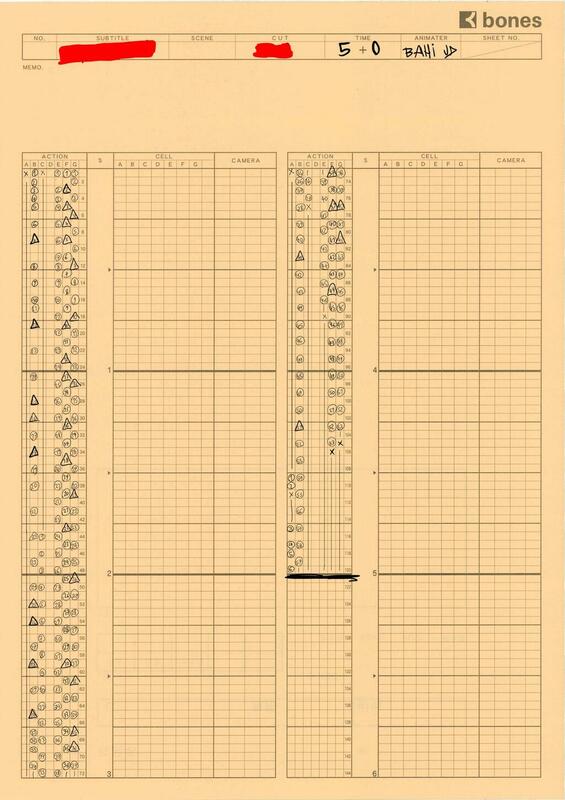 It also has crazy sakuga line-ups like the aforementioned #13. That animation range makes it hard to assess the visuals overall, but that’s hardly a bad thing – style consistency is no concern if a series is as competent as YamaSusu has been. KimiUso on the other hand is more regular, even the insane Kojima episode stays in line with the general aesthetic of the show; exaggerated character acting that often leads to very cartoony cuts, plus tons of smears. The staff puts lots of care into the performances and it shows, especially when violins are involved. It’s probably not realistic to expect the second half of the series to be on the same level as what we’ve seen so far, but I’m convinced it’s still going to deliver lots of impressive animation. Also noteworthy I thought was Free! ES, which improved a lot upon the prequel and brought Utsumi’s output much closer to the excellent episodes she used to deliver. You’d expect KyoAni’s most impressive offering to be the Takemoto series, but while Amagi’s been a solid test for the studio’s newbies I think I’d rather pick Free! ES. Thorough care and some smart changes (like making the water effects less flat and cartoon-like and more photorealistic to better fit the show’s style), as well as the swimming motion having more kick to it did the trick. Last year I complained that we got a really weak movie line-up, and 2014 sure decided to make up for it. We’ve had stuff like Majocco, the best animated piece ufotable’s put out in a long time, as well as notable film sequels to already excellent productions like Idolmaster and Tamako; the former just about what you’d expect from Goripon’s Imas, while Yamada went out of her way to make Tamako Love Story feel entirely different from the original (more on that later!). However, as good as those are there’s a clear winner this year, a film that is truly on a level of its own. Kaguya-hime is a sight to behold, from the rough yet always deliberate lineart to the delicate character motion, every single scene in the movie is absolutely gorgeous. Takahata and Konishi landed one of the best animated movies of all time, something all animation fans should watch. There’s no better way to celebrate Tomoyuki Niho’s comeback to TV animation in 2014 than with his amazing OP for Garo. ED – Sora no Method & Barakamon Double solo animation goodness, Ebata’s SoraMeso and Nakayama’s Barakamon. Seiichi Akitake jumped from being someone whose existence I was simply aware of to being one of my favorite KyoAni ADs, he’s kept on improving and nowadays his episodes are consistently some of the best the studio puts out. Wild character motion, lots of expressive limbs movements, and integration of those with complex cuts make his work a pleasure to watch. As far as complete discoveries go though, it’s got to be Kazuaki Shimada for me. Having looked up his portfolio I realized he’d done solid work before, but it wasn’t until his solo Yama no Susume episode that he delivered genuinely noteworthy work. His charming animation there makes me look forward to his further growth, it’s a name to keep an eye on. Considering KuroBas is a production disaster that Nakazawa’s (unsuccessfully) been trying to carry for two seasons, I can’t say I expected Haikyuu to be anywhere as good as it ended up. Thoroughly polished if not amazingly animated, and featuring plenty of sparks of brilliance; the show at its best has excellent character acting, which translates to some great, very deliberate motion within the matches and extremely lively animation in normal scenes. Ryo Araki did tons of work, and his chara animation style (very similar to Takeuchi’s, who also appeared once) exemplifies what Haikyuu excels at. Overall I wouldn’t put it on the same level as this year’s best animated series, but it’s still a noteworthy production that managed to surprise me. To end this, here’s a couple of great recs that don’t necessarily fit the other categories but deserve separate mentions: Tamako Love Story isn’t an animation beast like the K-ON! movie, though it’s more than functional in that regard – with Horiguchi helming the animation, it was bound to have excellent character cuts. What’s most impressive however is the new look Yamada created to better fit the completely different themes TLS handles, a departure from Tamako Market’s TV visuals. The color palette ditched the bright colors, and the extensive filter usage helped it feel like a cosy teenage love story. KyoAni’s postprocessing has been quite good for a while, but they absolutely nailed it with this movie. The photography and composite work might very well be my favorite in this medium. I can appreciate both how good it looks and how integral to the direction the visual changes in regards to the original series are. You ought to give it a watch even if Tamako Market didn’t quite convince you. -I’d advise to go check out Animator Expo because Khara’s put lots of effort and talent into the project, but the quality of the shorts is very uneven so might as well point people to the absolutely best one first. Nishi-Ogikubo can only be described as “the best animators in the industry get together to draw a naked cockroach”. Just go watch it. 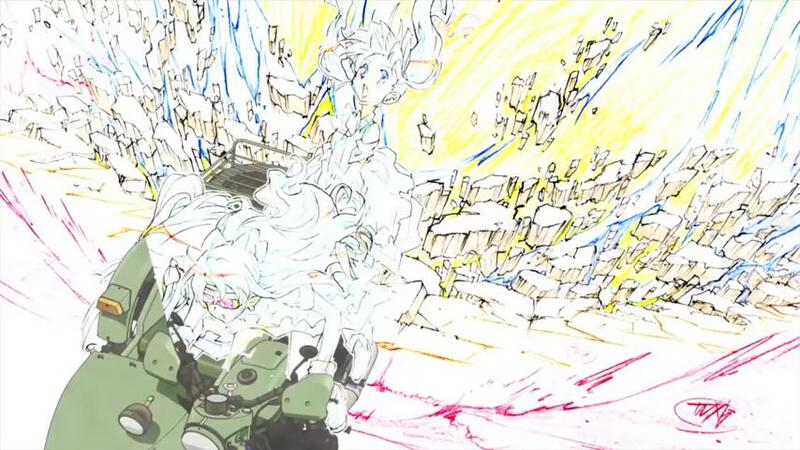 The final 5 minutes of the first episode featuring a crazy action sequence animated (in order) by: BahiJD, Yutaka Nakamura and Norifumi Kugai. This is something that any animation fan mustn’t miss. It’s a great showcase of three different animation styles – BahiJD’s use of very high amount of drawings, Nakamura’s efficiency and Kugai’s limited animation. Sakuga festival. Watch it if you haven’t done so yet. One of the most impressive TV anime productions of all time? Possibly. The series is a fascinating showcase of different directing and animation styles. From Kanada-style action to realistic character animation – all of it is here. Regular animators like Yutaka Nakamura, Gosei Oda and Norifumi Kugai provide solid animation throughout the series, joined by guest appearances of legends such as Takeshi Honda and Shinya Ohira. If an anime with such an artistic range is not a sakuga anime, then I don’t know what is. Honorable mention: Yama no Susume S2 – not quite as well made Space Dandy alternate universe. Is it possible to make a film that looks like a moving picture book in the age of digital animation? Isao Takahata, Osamu Tanabe and Kenichi Konishi say: YES. Carefully crafted animated movie where everything fits together perfectly like a puzzle. Ohira and his pals going wild. Ryouma Ebata is a huge talent. Let’s all forget Mahou Sensou and watch this instead. Kugai got first noticed by joining Ascension’s Anime Mirai (Project A) short. After that, he didn’t do anything that would catch the attention of animation fans, until Shingo Natsume picked him up for Space Dandy. His animation has a very limited number of drawings, he also works with flash, making it very easy to recognize what he’s animated. I think he’s definitely a name to keep an eye on. Yeah, this thing came totally out of nowhere. Tomoyuki Niho is considered to be a very controversial animator thanks to his very rough works on Birdy Decode, but giving him a free reign to create an opening animation that looks nothing like the show was a perfect idea. I had a lot of shows to enjoy this year more so than in previous years but my favourite this year was most definitely The Legend of Korra. Studio Mir did such a wonderful job on the artistry that there was not much to complain about. The thing that excites me most from Mir’s work this year is the loosening of the house style they employ. From their overall work this year on The Boondocks and the 2 Korra books, we’ve seen smears galore, more impressive effects animation and outlandishly well-choreographed fight scenes. The runner up here was Space Dandy because while I love it immensely, I just enjoy shows with a serialized story more despite the fact it’s a better animated show. I’ve actually tried to keep up with Naruto in previous years but this year I just couldn’t bring myself to do it. I generally only come back now for episodes directed by Hiroyuki Yamashita or with good animators like Tsutomu Oshiro. This episode featured my favourite cuts yet from Naoki Kobayashi who continues to be my favourite new talents working on that show. I saw this movie in the theatre and had a great time. While I acknowledge it has a myriad of flaws, taken at face value it’s a pretty good movie about the life of a creative individual. It helps greatly that, as is expected of Ghibli, the animation is great with many well animated sequences my favourite being the start of the earthquake sequence by Atsuko Tanaka. Runner up is Kaguya Hime because while the animation was impressive, the story was less engaging. What can I say; I’m a sucker for a good Back-on song and fast paced Gundam action. Kugai was one of the many talented folks that worked on Space Dandy and like his peers he produced a good amount of great work that I really enjoyed. It’s hard to imagine I wasn’t aware of him up till then but I especially love his short dance sequence in the “Viva Namida” music video. Its most definitely the best work in that video and his work on Space Dandy itself was very lively in the limited anime sort of way and has a simple but organic and very weighty feel to it. He really impressed me with his versatility with all the different sorts of cuts he got to do and that’s why I picked him for this category. Runner ups would be Takashi Torii (whom I discovered near the end of last year and who’s producing good work on Nanatsu no Taizai) and Naoki Kobayashi for his great work on Naruto in Hiroyuki Yamashita’s stead (who has been doing more directing work as of late). Shigatsu wa Kimi no Uso was a bit of a shock to me in its overall quality. The character art is impressive and the movement has a subtle human quality to it. With A-1 producing so many shows I didn’t really expect anything from it but like Nanatsu no Taizai, they have a good core staff doing good work set up. Though all of us are probably already watching I’d still highly recommend Shirobako. One of the biggest surprises of the year for me as I wasn’t even aware of it till the first episode was out but it is basically everything I’ve ever wanted in a show about making anime. Also Ema is best girl. It’s really difficult to choose because Space Dandy has many impressive episodes, though the most interesting ones aren’t necessarily the best animated such as episode #21 and vice versa for episode #17. So animation-wise I’d pick the explosive finale since it contains everything and episode 18, Kiyotaka Oshiyama’s solo work. This episode has unique style and design, it features such a lively and malleable animation, a pleasure for the eyes. Nearly a decade later, Mushishi comes back at full force. Originally Mushishi was already a strong work but Nagahama’s thorough direction and Umakoshi’s animation direction made the anime much more amazing. The anime is faithful to the manga (Nagahama mostly uses manga panels for his storyboard) so one of the most important areas of impact is the animation. The staff know their stuff and probably studied various movements to make things look much more believable. 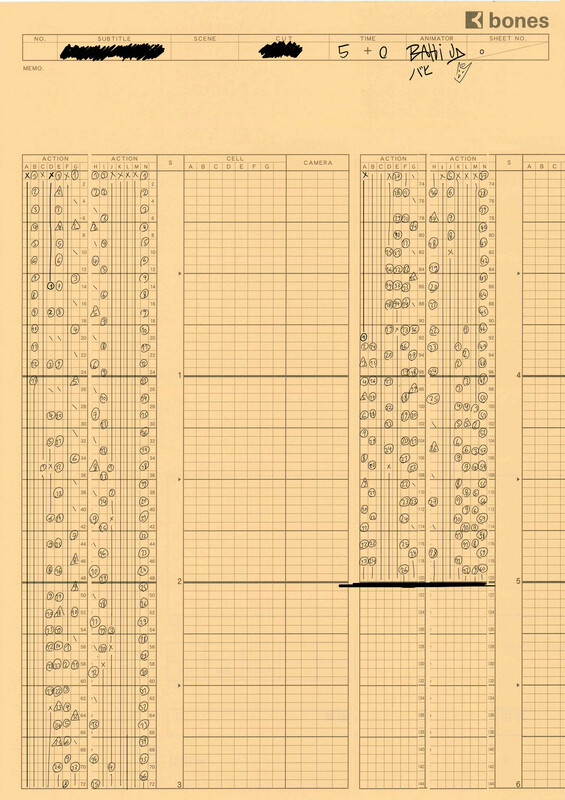 Example: Episode 9. An old man cuts a piece of wood but not in a flashy way. The manga doesn’t really show how the wood is cut, but the anime depicts the movement. It doesn’t seem like how one would typically cut wood but he seems to use a specific countryman technique. There are no careless cuts, even the simple act of walking is thoroughly animated with a great sense of balance, even the centre of gravity shifting is taken in account. Mushishi doesn’t have much flashy animation but it does impress with its subtle animation. If Mushishi didn’t exist Space Dandy would be my choice because of the richness of creativity & variety. The huge list of various creators makes many episodes unique with top notch scenes. Haikyuu is also worth checking since it’s a great sport anime. Volleyball isn’t easy to animate since the whole body is affected and animators have to handle difficult parts like hands and ball physics. Plus the animation quality is consistent. Kaguya-hime is a 2013 movie but it has to be here. I’m glad I was able to watch it on a theatre screen since it’s so gorgeous. It’s amazing how they put such energy and life into the drawings. It’s visually very expressive: drawings speak for themselves. It’s an ode to life. You can clearly feel Osamu Tanabe’s touch in this movie with a lively and realistic animation. There are a lot of realistic gesture of everyday situations but also technical stuff like weaving or cutting down bamboo. I have to mention the escape scene done by Shinji Hashimoto, it sure gives the chills. You feel her rage only throughout the animation since she remains silent. There’s so much strength in this scene. 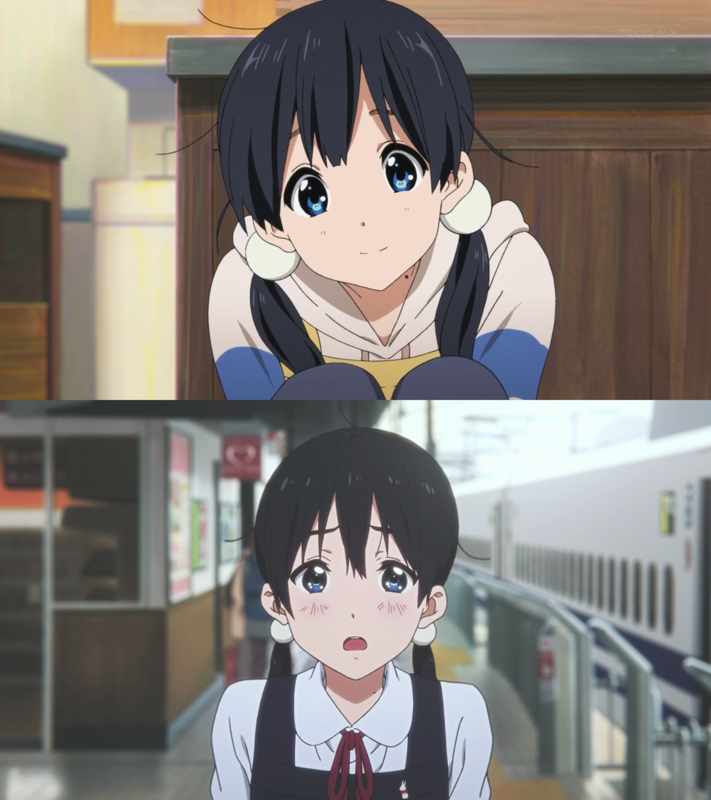 As a 2014 movie Tamako Love Story is certainly a neat work with the usual solid KyoAni animation, above all it features Naoko Yamada’s clever direction. You can feel Yamada’s sensitivity through her storyboard, the subtle character animation and the great photography, it has this nostalgic feeling. The ED is also fantastic. I remember some of his stuff on Gargantia but a recent MAD made me more aware of his work on Kuroko’s Basket and Haikyuu. Araki has a good understanding of the human body, muscles and joints, he knows how to articulate arms and legs quite well. His effects are also specific, there’s kind of viscosity. He also tends to draw quick effects on 1s. He has recently worked along with Tetsuya Takeuchi and I think it has influenced him. A simple concept mostly animated by the best realistic animators. This is pure gold. Otherwise I’d recommend Yama no Susume. It isn’t that much impressive animation-wise but it still is beautiful and an honest work. Plus it has some surprising delightful stuff like an OP by Ishihama, a unique episode by Kazuyoshi Yaginuma and some guest stars like Norio Matsumoto. Click on page 2 to read more!